This report is intended to help mine safety trainers better prepare to teach the influx of new underground coal miners who are entering the industry. This is done by identifying two different approaches to instruction and discussing the ways they may affect how well prepared new hires are to deal with a dynamic and hazardous workplace. One approach is based on the use of a syllabus. Those using a syllabus are more likely to rely on lecturing or direct instruction. This is a good way to get across factual information, but does not provide a context within which miners can fit the discrete facts so that they form an integrated whole set of concepts, principles, and skills. The other approach is based on the use of a curriculum. 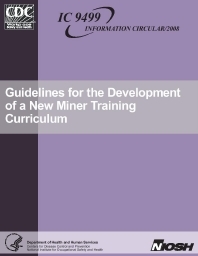 Those using a curriculum may be more likely to help miners integrate concepts and skills that give them an overall picture of the complex mining environment and how they fit into the workplace. This will better prepare them for the decision-making and problem-solving activities that will help them work safely and productively.